Pat Nicol took these two pictures of the eclipse in Midsomer Norton. Rich Wiltshire took this superb photo of the eclipse in Bridgwater. 17-year-old Chloe Charlesworth took this in Corsham. Skydivers in Wiltshire had the ultimate view of this morning's solar eclipse. Sean Garrett took to the sky with Tandem Skydive Instructor Michael French, while cameraman Lee Thomas floated near-by to catch the moment on camera. Dozens gathered at Clifton Observatory in Bristol to watch the solar eclipse over the Clifton Suspension Bridge. Many astrology fans are wearing special glasses to protect their eyes while others have brought home-made pin hole cameras. Students Greg Robertson, 19, and Sam Firminger, 20, began quaffing a bottle of champagne in preparation for the spectacle. When we were walking up here we were disappointed because it looked cloudy but it seems like Bristol has pulled it out of the bag. The biology student said they were both hoping for a "beautiful eclipse". Connor Fitzpatrick and Luke Kerckhof used a colander to see the eclipse. Amy Whitewick took these photos from her front garden in Seend Cleeve, Wiltshire. Nick Cork sent us this great photo from Glastonbury. This photo came from Simon Burton in Chipping Sodbury. Sue Bradley took this from her garden in Longlevens using a piece of welder's glass! Cotswold Astronomical Society staged an eclipse watch in the park for members of public and kids from Naunton Park School today and were on hand to offer advice and expertise to anyone who asked. Peter Cadogan, of Cotswold Astronomical Society, spoke with us at the event. 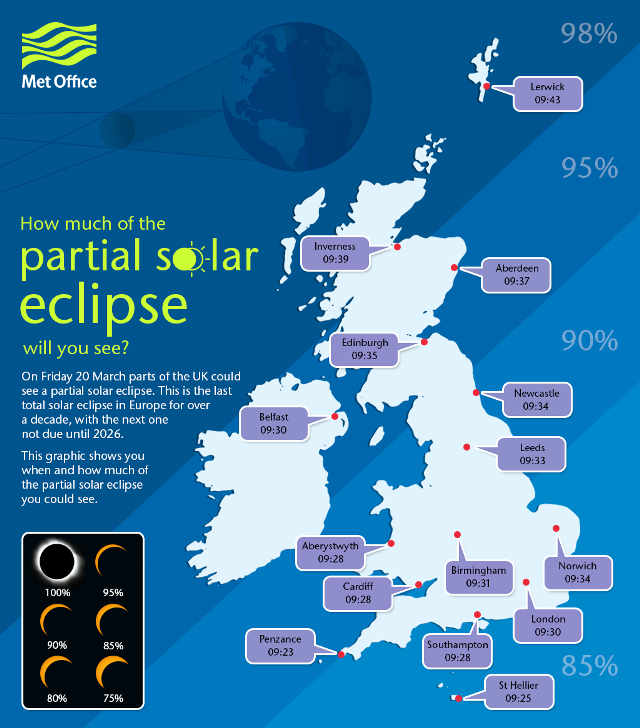 At around 9.30 this morning, people across the West Country should be able to see a partial solar eclipse. The moon is expected to cover up to 90% of the sun. The last one happened in 1999, and there won't be another in the UK until 2026. Experts are warning people not to look directly at the sun - and safety glasses are available. The most important message is never look directly at the Sun, even through sunglasses or dark material such as a bin liner. Will you be able to see the eclipse? It looks like those in the South West may be in luck when it comes to viewing the solar eclipse tomorrow morning. The event - the passing of the moon between the sun and earth - is due to take place at 8.45am on March 20, when much of the UK could be under cloud. As the moon passes the sun the skies will briefly darken, but the dramatic effect might not be so mesmerising due to the forecast grey skies. But for we may be lucky in the South West as breezes as set to move the clouds out of the way just in time. For those lucky enough to be under the clearer skies, the eclipse will start at 9.23am in Penzance and work its way incrementally later the further north you live. This is the last total solar eclipse in Europe for over a decade, with the next total solar eclipse not visible in the UK until 2090.